Samsung is about to launch its "Samsung Circle" : A Portable Media Player with circle shape. On the front panel there's full touch screen with a standard jack of 3.5 mm and menu button on the edge of the player. it is very light weighted which makes it easier for a user to carry it around and can easily fit in the pocket. The idea behind this concept is easy and elegant. Modern industry of portable players uses square and rectangle shape players , Samsung Circle is a quite interesting and creative media player and certainly it'll rule over the market after it gets launched. 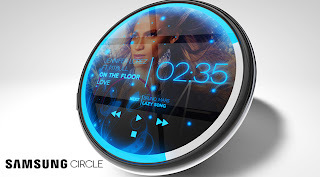 Samsung Circle has a transparent interface, on the edge there is a standard headphone jack of 3.5 mm and menu button. It will attract a thousands of users due to its shape and its nice interface. Samsung has not launched it yet as it is trying to remodel it to make it much more better, to make it more user-friendly by including important key features like: Providing users Web-Browsing feature, ability to view all the videos, Wi-Fi etc.